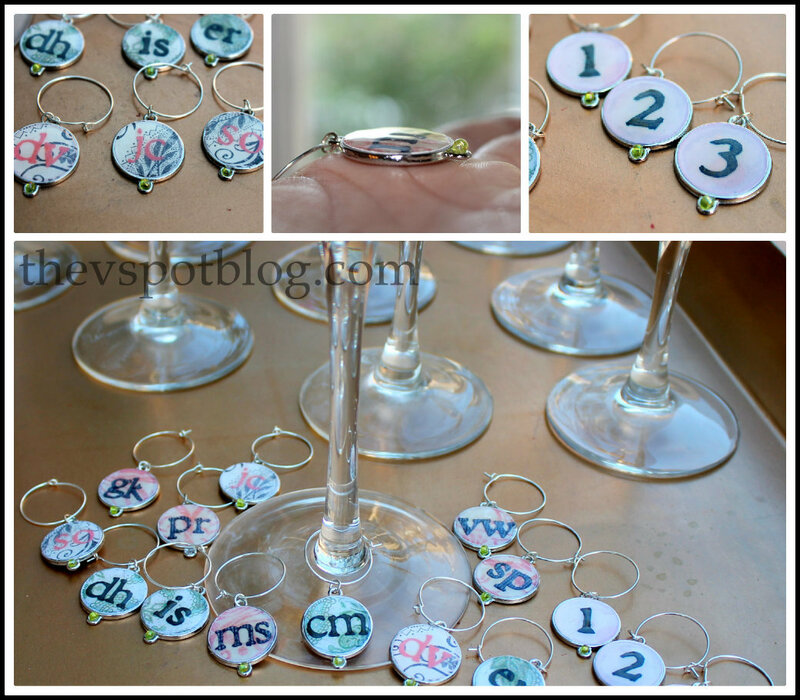 I took a little departure from my “Bunco Week” yesterday to discuss cultivating good manners for your kids, but on Monday I shared my revamped outdoor chandelier and no-sew cord cover and on Tuesday I shared my wine bottles turned water carafes. Today…? Last year when it was my turn to host bunco, I made all of my bunco friends a personalized etched wine glass that they got to take home with them. 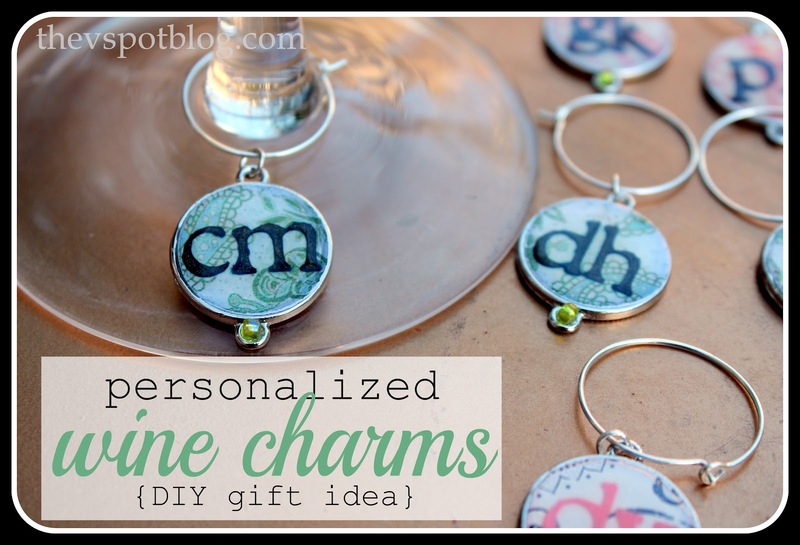 Since everyone’s wine glass is at home, this time I thought I would make wine charms that we can keep in the group’s “Bunco Box”. 1. I used jewelry forms for the base. I am not a jewelry maker, so I may be wrong, but I think these were meant to be used for a bracelet, but the were just the right size. 2. I used my Cricut to cut out circles. 3. 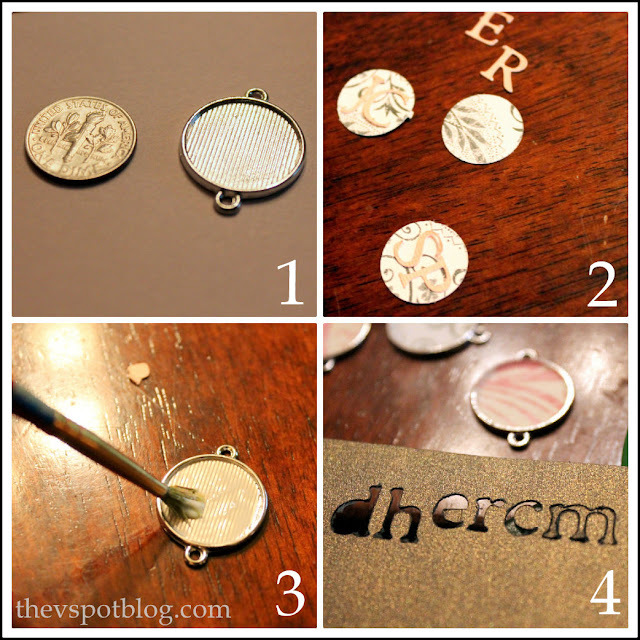 Brush a little glue or Mod Podge into the jewelry form and press the circle in so that it is firmly adhered. Next, the Dimensional Magic. I love this stuff! I worked on an old cookie sheet because the Dimensional Magic needs to set and cure for 24 hours. Holding the bottle at an angle, slowly squeeze and the Magic flows onto the tops of the charms. When dry, they will look like they are under glass. Place the charm on a simple earring hoop and we’re all set. Have you tried this stuff? What did you think? Plaid sent me product, but I have not been compensated for this post. All opinions expressed are 100% my own. I had fun playing with this and will be making more projects using it. I never recommend things that I don’t personally love. I’ve been dying to try that stuff. I had never heard of Dimensional Magic before, but now I really want to try it! These look wonderful! VIV! Those are amazing. You, of course, make it look so easy too. Your friends will love them. I would be nowhere without tweezers and granny glasses. Cute project. Love this project Viv! Don’t you just love dimensional magic?!? I fell in love with it a few years back when I first started using it! 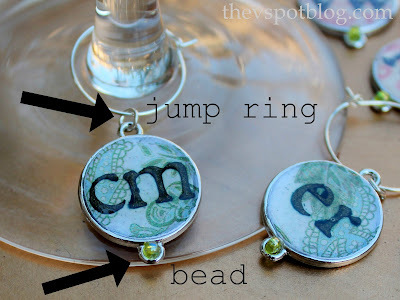 I haven’t tried it, but I’d definitely like to now LOL This seems so much easier than trying to find a glass round to fit the base. I think these would be really neat tied onto gifts for the holidays or birthdays!